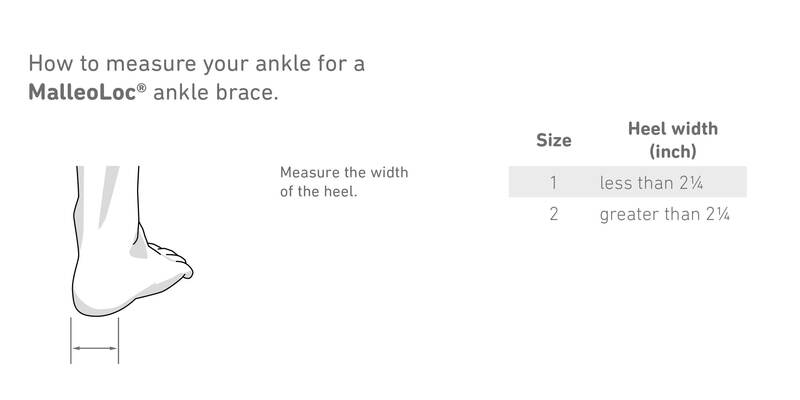 Left 2 - Heel Width Larger than 2.25" Right 1 - Heel Width Smaller Than 2.25" Left 1 - Heel Width Smaller than 2.25" Right 2 - Heel Width Larger than 2.25"
Get back into action with the MalleoLoc Ankle Brace. MalleoLoc is perfect for playing basketball, volleyball or everyday activities. The MalleoLoc stabilizing ankle brace increases ankle stability without restricting mobility. 12013013080702 - Left 2 - Heel Width Larger than 2.25"
12013013080601 - Right 1 - Heel Width Smaller Than 2.25"
12013013080701 - Left 1 - Heel Width Smaller than 2.25"
12013013080602 - Right 2 - Heel Width Larger than 2.25"
Sturdy. Lightweight. Safe. Easy Storage. I recommend it for Stroke recovery along with therapy . Stabilizes. Easy To Use. Effective. Comfortable. Sturdy. Lightweight. Safe. Easy Storage. Extra Support. Exercising. Hiking. Long Days On Your Feet. Work in Higher Education. Administrative Assistant. Event Organizer. This product has made running around the College so much easier. Where I used to have to take the elevator to get around the campus, I now am able to jog up and down the stairs again. I am able to walk my dog, hike with my kid, and all around live a much more active life without the fear of my ankle giving out. With torn ligaments on both the inside and outside of my ankle, this brace is a lifesaver! My wife has a drop foot and we are trying to find a brace that gives her support that is not as bulky as her AFO. It is very good quality, but she can't bend over to reach the straps due to flexibility issues. This is a good quality brace though. THIS PRODUCT DOES NOT FIT INTO SHOES AS I HAD EXPECTED. I CAN'T WEAR IT WITH ANY SHOES EVEN TENNIS SHOES. I AM DISAPPOINTED IN THAT ALOT .. I CAN WEAR AT HOME IN HOUSE TO EASE SOME STRAIN ON THE ANKLE , BUT THAT IS IT.BUT SINCE I BOUGHT TO PRIMARLY WEAR IN SHOES, I AM ANOT REAL HAPPY. by KARIN OFFICE WORKER from PHOENIX, AZ. Stabilizes. Effective. Sturdy. Lightweight. Comfortable. Competitive Athlete. Do it yourselfer. Paramilitary. Paramilitary. Caregiver. This is the most supportive and comfortable product for preventing ankle from rolling. I have tried many. I have several ligament tears in ankle and this product allows me to return to soccer and other activities that other products can't. It fits well in shoes. It would be 5 stars if there were a way to have it customized for a more perfect fit. It is a little difficult to get in the right spot, but once it's there, it's game on! After an ankle replacement along with 2 fusions, I am walking on the outside of my foot and have been told that my condition cannot be surgically repaired and that I would have to always wear a brace of sorts. The 2 that I currently have are very bulky and uncomfortable. Would this be a good investment for me? I have a similar condition and find the current design of the MalleoLoc Ankle Brace a great improvement. Its comfortable and really works. Its the only brace I have found that I can ware for an extended period. I recommend it. This made of plastic but some part made from something like cloth other wise you can not use molleolock instead of air cast because air cast help about weight bearing.Don't take wt. alot to your ankle. Yes, you can wear this in water. The cloth that the person in the last reply mentioned is all man made materials that hold up under water. There is no elastic to get messed up by chlorine or anything. All "soft" parts of this brace are replaceable. I personally have had no issues with this brace so far, in fact I have been able to go hiking, run up and down stairs, and I am looking forward to the pool opening up for the summer.